Please enter text (including spaces) upto 12 characters in length only. Please Note 1. Due to personalization of this item, it is not returnable nor refundable. 2. Text will be inscribed exactly as entered. 3. Only standard American keyboard characters can be inscribed. Flowers will brighten any room, so bring a little cheer to her day with this Personalized Felicity Bouncy Bouquet Pillow Case. This playful "dark pink" flower blossoms design is also available in several other colors; which makes finding the right color that best fits her bedroom décor a reality. Personalize with Name or other Phrase with upto 12 Characters in Length. Creativity is Encouraged! Pillow Case Measures 22" x 30". Fits Standard and Queen Sized Pillows. 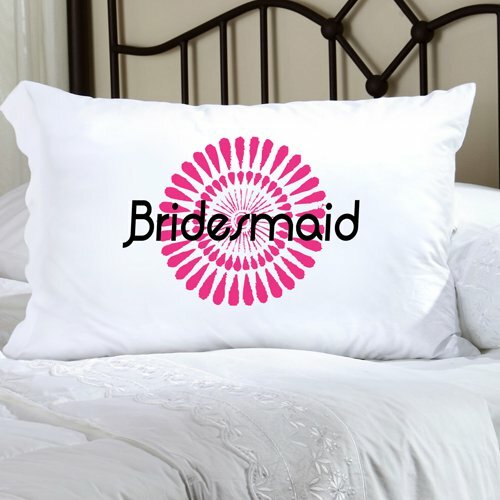 Made of Luxurious Poly Sateen for a Soft Feel and Long Lasting Slumber. Pillow Case is High Quality and Machine Washable. Due to personalization beign a matter of personal taste and since the personalization can not be undo, we can not accept returns nor can we issue refunds for this personalized item. The color description of the item's flower blossoms design is only used generically. This pillowcase can only be personalized with a maximum of 12 American keyboard characters only (every space counts as a character) and only in black letters and in the same font style as seen in the item's image. 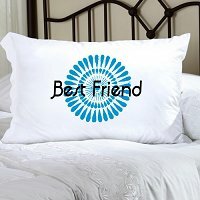 Also, personalization of the pillowcase is case sensitive and will be inscribed exactly as entered. Please only enter upper and/or lower case letters (and other keyboard characters) exactly as the inscription is desired.